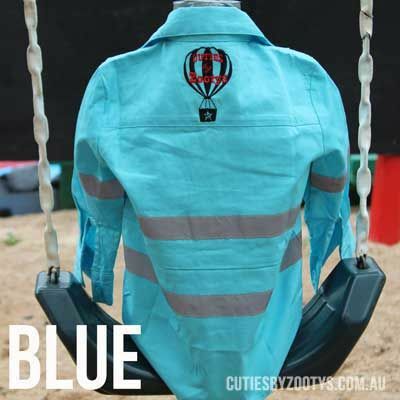 Blue Work Shirt - Cuties By Zootys: Do your kids want to be just like their Mum/Dad, Aunt’s/Uncles or even Grandparents, when it comes to “working hard” on the yard or out on the property? Do your kids love to get outside and “work” with you? Then Cuties By Zootys – Original Kids Hi Viz Work Shirts, are the perfect answer to help your kids “work hard” safely everyday! Not only will your kids LOVE being just like you, you can rest assured that your helping them understand safe working practices not only in the yard, on a property, camping, fishing, but also when they are just riding their bikes. With a Cuties By Zootys – Original Kids Hi Viz Work Shirt your helping them understand how to be safe in numerous situations.